Gary Warby, Director Premier Windows Aylesbury, talks to us about why adding sq. footage to your home increases the price of your home. It is said that the UK’s homes are some of the smallest in Europe, which means space for many of us can come as premium which some are willing to pay for. A study published recently by Nationwide has shown that by increasing the floor space on your home by 10 per cent, your house price will increase by 5 per cent. With interest rates hitting record lows in the Brexit-era the it makes extending your home one of the best investments that you can make! Extending your home can be expensive and often pretty noisy. Modern methods of construction exploit off site manufacture, to minimise the impact of installation on site. 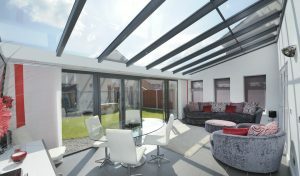 Featuring a combination of full height solid walls, glazed, part glazed or lantern roofs contemporary glazed extensions deliver a style and a sense of luxurious exclusivity, at fraction of the cost of a traditional extension. This means that you get a great and highly flexible living space but also maximize the return on your investment. This is because orangeries, conservatories and glazed extensions exploit all of the benefits and cost efficiencies delivered through off site construction. This keeps the price point to a minimum while still delivering lots of flexible year round land light-filled living spaces. Featuring more brick-work and a larger solid area roof, alongside flexible and multi-configurable glazed panels, glazed extensions offer particularly flexible spaces at a highly affordable price point. One of the products we have to offer is The LivinRoof which is a charming bright glazed extension, and at the fraction of the cost of a traditional extension. Featuring an internal perimeter pelmet, the solid insulated and glazed roof system can be configured to almost any design. Why not have it all glass? Or if that is not for you then have the minimum amount of glass. The bright new extension can by used for any space. The options are limitless and adding sq. footage at roughly half the cost of a traditional build, it comes with a fantastic return. Email enquiries@premwindowsanddoors.co.uk or call 0800 854 353 to find out more.